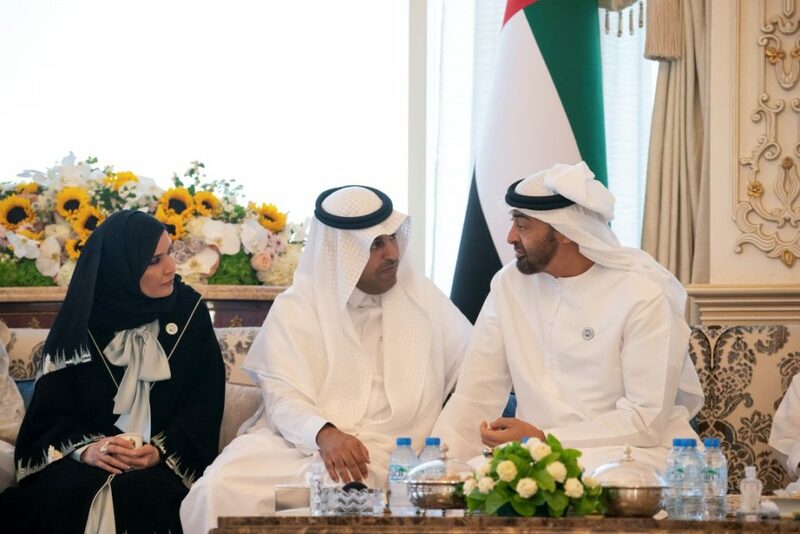 (Abu Dhabi) – His Highness Sheikh Mohamed bin Zayed Al Nahyan, Crown Prince of Abu Dhabi and Deputy Supreme Commander of the UAE Armed Forces, received the Speaker of the Arab Parliament, Dr. Meshaal Bin Fahm Al-Salami, the Qasr Al Bahr Majlis on Monday. He was accompanied by Dr. Amal Abdullah Al Qubaisi, Speaker of Federal National Council (FNC). His Highness Sheikh Mohamed praised the role of the Arab Parliament in addressing issues concerning Arab peoples including development, health and education and its efforts to deliver their aspirations for growth, development and prosperity as well as living in security, peace and stability. HH stressed the vital importance of Arab solidarity to face challenges facing the Arab region in this stage. Among those attending the Majlis were H.H. Sheikh Tahnoun bin Mohammed Al Nahyan, Abu Dhabi Ruler`s Representative in the Eastern Region; H.H. Sheikh Nahyan bin Zayed Al Nahyan, Chairman of the Board of Trustees of Zayed bin Sultan Al Nahyan Charitable and Humanitarian Foundation;H.H. Lt. General Sheikh Saif bin Zayed Al Nahyan, Deputy Prime Minister and Minister of the Interior;H.H. Sheikh Hamed bin Zayed Al Nahyan, Chief of the Abu Dhabi Crown Prince’s Court; and H.H. Sheikh Khalid bin Zayed Al Nahyan Chairman of the Board of Zayed Higher Organisation for Humanitarian Care & Special Needs (ZHO).